Don Milne here again at Roadtrip-'62 ™ to guide us on our twenty-fifth day of travel along historic US-6. Yesterday, we traveled 128 miles from Des Moines, Iowa to Council Bluffs, Iowa. Today we’ll travel a much shorter distance, just seeing sights in neighboring Omaha, Nebraska. Museums are at the top of our sightseeing list, though we will also stop at a zoo, see some former industrial sites, and even stop at a cathedral. If you see anything you like, get yourself out on the road and enjoy it in person. I hope you’re having fun on this virtual roadtrip, I know I am, but there's nothing like the real thing! At any time, click on an underlined word below to learn more about the places on the trip. Wow, this is a long trip! Our trip down US-23 was done by day 20, but we’ll just have to get back on the road again. While I drive over to breakfast, I should mention that the reason we didn’t stop out for a movie at a drive-in last night is because the drive-in is gone. In 2007, Google began construction of a server farm on the former site of the Council Bluffs Drive-in theater. That was the last remaining drive-in in the area, though at one point, the Council Bluffs-Omaha area had a half a dozen. Others were the 76 West Dodge, the 84th & Center, the Capris, the Golden Spike, the Skyview, and the Q Twin. But now, when you want to find a drive-in here, just Google it. Let’s head back downtown to Duncan's Café, where they serve full breakfasts on big skillets. I think this restaurant is old enough for us, and it has a small town look even in a big city. It’s long and skinny with booths on the sides and lots of odd things hung on the walls. Besides, maybe I can finally get that Iowa delicacy, a giant pork tenderloin sandwich, before I leave the state. Just west of our motel, before we cross the Missouri River, there was an amusement park back in 1962. Playland was originally a dog racing track before morphing into a combination stockcar track and amusement park. It was opened by the infamous gangland figure Meyer Lansky in 1941 and ran dog races and gambling for three years until the city shut it down. It was converted to a dirt auto-racing track and a midway was added in 1948, complete with a roller coaster. Midget auto racing took place here, with regular stock car races beginning in 1950. NASCAR Short Track Racing held its Championship race in 1956, after the track was paved. Everything was still operating in 1962: the races, roller coaster, Wild Mouse, bumper cars, Tilt-A-Whirl, and midway games. But the freeway was coming and 60 acres were condemned in 1966 for the I-480 bridge we’ll cross. Playland limped along until 1970 in its smaller state, when the owner died and remaining rides were moved to another park owned by the family in Oklahoma. The racetrack continued until 1977 but the land is now mostly a public park, with one area scheduled for a new housing development. In 1962, US-6 did not use a freeway to enter Omaha, Nebraska. The bridge here then was the Ak-Sar-Ben Bridge, which was built in 1888 by the Omaha and Council Bluffs Street Railway Company to handle streetcars. This Whipple through truss bridge was the first road bridge to cross the Missouri River into Omaha and tolls were charged for cars and trucks. It was widened in the 1920s, as auto traffic increased, but with that increase, dissatisfaction with the tolls also increased. Because of this, a group of local businessmen called the "Knights of Ak-Sar-Ben" bought the bridge with the intention of making it a free bridge. They had to continue to charge tolls until 1947 when the debt was paid off. And in case you’re wondering about the odd name, Ak-Sar-Ben is Nebraska spelled backwards, cute, eh? The new freeway bridge opened in 1966 and all that remains of the old bridge is one pier in the river, just south of the new bridge on the Council Bluffs side. Speaking of the Knights of Ak-Sar-Ben, they were first organized in 1895 for another civic purpose: to save the Nebraska State Fair. The State Fair Board threatened to move the fair to Lincoln, Nebraska, because Omaha was providing no entertainment other, “…than saloons, gambling houses and honkeytonks…”. In response, the Knights funded a trip to New Orleans and brought back some Mardi Gras floats for a parade. They have been a backbone of civic life in Omaha ever since, and besides making the Ak-Sar-Ben Bridge free, they established a racetrack, held community celebrations and competitions revolving around agriculture, awarded thousands of scholarships, donated fleets of ambulances, and doled out grants for many community projects. In 1962, they began the Ak-Sar-Ben Western Hall of Fame. The Ak-Sar-Ben Race Track and Coliseum was their world class horse racing track, and we could have seen races in 1962. The first track was opened in 1920, rebuilt in 1928 after a fire, and by 1984 it was the sixth most popular horse racing track in the country, measured by attendance. The track closed in 1995, as many horse tracks have, because other forms of gambling cut into revenues beginning in the late 1980s. Much of the property has been sold and redeveloped by businesses and the University of Nebraska. By the way, don’t look for the Nebraska State Fair here either, it eventually moved to Grand Island, Nebraska. Having crossed the Missouri River, we are now officially on the Great Plains. What makes the Great Plains, you might ask? Several geological and climate features have created this mostly flat landscape that naturally grows mostly short grasses, over an area extending from within Mexico near the Rio Grande River to central Canada, and from the Rocky Mountains to the Missouri River and Red River. Route US-6 travels across what’s known as the High Plains near its northern edge, which is roughly along the Platte River to the north of us. This area is characterized by a very thick layer of sedimentary rock with deep and broad valleys cut by rivers. This base of rock was formed by erosion from the Rocky Mountains to the west, and it filled in an ancient inland sea that once lay between the Rockies and the Appalachian Mountains. The High Plains receive somewhat poor and unpredictable rainfall, which sometimes led to disastrous farming years before modern pumping of groundwater. When the region was first settled in the late 1800s, periods of good rainfall would attract large numbers of settlers but several years of drought in a row would turn their newly plowed fields into dry wastelands. This happened several times in the late 1800s and early 1900s, and the infamous Dust Bowl during the Great Depression of the 1930s appears to have been the worst. Today, pumping from the underground Ogallala Aquifer, which is estimated to hold as much water as Lake Huron, is a major source of irrigation water for agriculture and helps to even out the years of poor rainfall. Even so, extreme weather is a major problem for farming. The Great Plains experience more tornadoes than any other part of the US. Hail storms still destroy millions of dollars of crops annually, and floods on the usually calm rivers destroy crops, buildings, and roads even as recently as 2012. The Missouri River we just crossed, also known as the Big Muddy, is the longest river in the United States. It flows 2,341 miles from its headwaters at Three Forks, Montana, to where it meets the Mississippi River at St. Louis, Missouri. Its watershed is one-sixth of the United States, but it is no longer the force of nature it once was. Before it was dammed and altered in the 1950s, spring snow melt and rains would cause the river to carve new courses through the valley, flooding farmland, forests, railroads, and towns. Some of these new river courses would even move state lines! For example, here in the Omaha area, the city of Carter Lake, Iowa has been cut off from the rest of Iowa by the Missouri River, which has changed its course so much that you have to drive through Nebraska to get back into Iowa. The need for safe and dependable river transportation and protection of farms and towns encouraged people to try to tame the river. There are now 15 dams on the main river, with 6 major dams. The Fort Peck Dam in Montana was the earliest, constructed between 1933 and 1940. Garrison Dam in North Dakota was constructed between 1947 and 1953, and the Oahe Dam, Big Bend Dam, Fort Randall Dam, and Gavins Point Dam were all constructed in South Dakota between 1948 and 1963. Oahe Dam began generating power in 1962. As a result, one-third of the river's length is now just reservoirs. Additionally, the lower third of the river from Sioux City, Iowa to St. Louis, Missouri was forced into the 600-foot-wide, self-scouring navigation channel we see in Omaha. A finally, the river was straightened in various places, cutting 205 miles from its length. Only a third of the river now remains in a natural or semi-natural state, so while the changes benefited millions of people, there was a cost to the environment. Let’s see what Omaha, Nebraska has to offer. We meet a couple of other US-numbered routes as we come off the bridge. Besides US-6, the Ak-Sar-Ben Bridge carried both US-30 ALT and US-75 back in 1962. As I mentioned yesterday, US-75 was moved wholly into Nebraska in 1984 to replace US-73. Previously, US-73 would have greeted us at the bottom of the bridge and run north on what is now US-75. We no longer see US-73 here at all, because it was shortened to just 113 miles from Bonner Springs, Kansas to Dawson, Nebraska at that same time. From the end of the Ak-Sar-Ben Bridge to N. 130th Street, US-6 used two one-way streets through downtown Omaha in 1962, as it still does today. Westbound on Dodge Street it’s flanked by new and newly remodeled buildings and parking garages. Lots of glass, steel and concrete, and very few old brick or stone buildings remain: the Federal Office Building being one prominent exception. Eastbound on Douglas Street, US-6 sees the back sides of some of these buildings, along with lesser commercial buildings and parking lots. Heading westbound, at the top of a hill just before reaching the Joslyn Art Museum, is Omaha High School. This is the third high school building on this site, and construction was begun in 1900. It is the oldest active high school building in the city. Some of its more famous alumni include Academy Award-winning actor Henry Fonda, billionaire investor Warren Buffet’s children, and Gerry Thomas, inventor of the TV dinner in 1952. If we had visited in 1962, we could have just walked in and wandered down the halls enjoying the architecture, an awards case or two, and maybe student posters in the halls. I doubt we could today, as most schools in the country have security measures that discourage or prevent entry for the general public on non-school business. Let’s make our first stop of the day the nearby Joslyn Art Museum. The Joslyn Art Museum is the principal fine arts museum in the state of Nebraska and houses a comprehensive permanent collection of over 11,000 works. Its strengths are in 19th and 20th century American and European art, with paintings by Mary Cassatt, Thomas Eakins, William M. Harnett, Albert Bierstadt, Grant Wood, Jackson Pollock, and contemporary works. Other highlights are Greek pottery, Renaissance and Baroque works by Titian, El Greco, and Jacob Van Ruisdael, and paintings by William Adolphe Bouguereau, Camille Pissarro, and Claude Monet. As with many art museums, this was a gift to the public. Sarah H. Joslyn bequeathed the museum in memory of her husband, George A. Joslyn, who was once the richest man in Nebraska. It was constructed in the form of a concert hall surrounded with art galleries, and opened in 1931. The new museum started out well by receiving several private collections as gifts, and collections from the Art Institute of Omaha and the Friends of Art. The Art Deco building has three-levels and uses 38 different marbles from around the world, including 250 railroad boxcars of Georgia Pink (Etowah) marble, the richest color marble in the United States. The Joslyns came to Omaha in 1880 and George made his fortune here in the newspaper business. He began in the business in Des Moines at the Iowa Paper Company, whose main business was providing small-town Iowa newspapers with “ready-print,” a newspaper sheet pre-printed with special features and advertisements on one side, which could be printed on the other side with local news. By 1890, George Joslyn had acquired controlling interest in the company and later expanded it across the country. By the time of his death, the renamed Western Newspaper Union was the largest newspaper service organization in the world. It operated printing plants and publication offices in 32 cities. In addition to the museum, the Joslyns actively supported community projects: it is estimated they gave more than $7 million to local projects including the University of Omaha, the Humane Society, the Old People’s Home, and the Child Saving Institute. We will make a stop later today at their home, Lynhurst, also known as “Joslyn Castle”, which has been open to the public since 1989, but there is a way we could have seen some of it in 1962. Back on US-6 after our stroll, let’s stop at Joslyn Castle next. George and Sarah Joslyn named their home Lynhurst, and constructed it in the style of castles they had visited in Scotland. Though landscaping began on the hilltop site in 1893, mansion construction did not begin until 1903. The building was designed by Omaha architect John McDonald. We can tour the 35-room today, but in 1962 you would have been able to see just a few rooms used as offices, because from 1944 to 1989 the home was the headquarters of Omaha Public Schools. When the school board moved out, the State of Nebraska took title to preserve the integrity of this architectural treasure. It has been operated for the public since then by the Joslyn Castle Trust, which finally purchased the Castle and grounds from the state in 2010. It’s certainly lunchtime by now, so let’s hunt for some food. Omaha is rich with vintage restaurants that are still getting good reviews, but we can’t try them all today. Here’s a short list of ideas for lunch. Orsi's Bakery & Pizzeria has been here since 1919, located in the Little Italy neighborhood. A fire destroyed the building in 1997, but the neighbors helped them rebuild and the next generation took over baking. Orsi’s serves pizza, goudarooni, cannolies, and Italian breads, and also sells Italian imported foods at their deli. But their food is available as take-out only, so I’m going to try somewhere else today. Another possibility is La Casa Pizzeria, located less than a half mile from Joslyn Castle and having a fun neon sign you can’t miss. La Casa opened in 1953 and legend says it was so successful that the owner ran out of food halfway through that first evening. This restaurant is also in its third generation of family ownership. These appetizers are enough to get you inside: Melanzana Fritta - deep-fried eggplant fingers served with marinara sauce, or Arancini – fried hand-breaded balls of Arborio rice, spinach, egg, fresh garlic, romano, and soft mozzarella served with marinara sauce. Finally, there’s a Bronco’s Restaurant just down the street from La Casa Pizzeria. Bronco’s opened its first location in 1959 and expanded locally as many early fast food chains did before McDonald’s came to town. The difference in Omaha is that there are still two Bronco’s in operation! Bronco’s is now the only non-franchise fast food outlet in Omaha that is locally owned and operated. Their second location opened in our favorite year of 1962 and is one of the two still open, so that makes my choice easy. And the cool neon cowboy on the sign adds nicely to the retro ambiance. Bronco's is one of the few places that still make their fries from whole potatoes every day. They also cut and bread their pork tenderloins fresh daily, as well as preparing their own chicken. I’ll be trying a Hickory Burger and Laredo Fries. Let’s turn around now and head back on the other one-way street that makes up US-6, toward downtown and the riverfront. Many of the downtown streets have been reconstructed for pedestrians, with narrow pavements, wide sidewalks and no curbs at crosswalks, and new brick pavers making the sidewalks more obvious and the travel lanes less obvious. Lots of parking garages on the fringes, and overhead walkways connect several buildings. There are also many architectural styles and periods represented in the large office, commercial, and warehouse buildings, indicating that Omaha has nearly always been a growing city. Many buildings around the fringe have been converted to apartments. We cross through this fringe to one of the old railroad yards, where Omaha's Union Station was once located. This historical treasure is now the Durham Museum. Because of the Transcontinental Railroad, Omaha became a railroad center, with multiple lines from all directions using the city as a hub. At one time, the Union Pacific Railroad alone had 10 passenger depots in Omaha! Increases in passenger traffic convinced the railroad of the need for a new station and construction of the new Union Station started in 1929 on the site of the old Union Station. Because this was the headquarters city of the Union Pacific, its leaders decided they needed a truly elegant and contemporary structure. Architect Gilbert Stanley Underwood, who was one of the finest architects in the classic art-deco style, had a hand in designing every facet of the construction, from the ceiling to the door handles, and from light fixtures to filing cabinets. When the station opened in early 1931, each feature displayed art deco details. In 1962, we would have still seen an active railroad station, with the hustle and bustle of people changing trains and using the wide range of amenities available within its walls. But increased air travel and the completion of the interstate highway network significantly reduced rail passenger traffic and the last passenger train departed Union Station in 1971. The station closed and in 1973, Union Pacific Corporation donated the building to the City of Omaha. The story of today’s Durham Museum begins in 1975, when a part of the building was reopened as the Western Heritage Museum, displaying small regional history exhibits and private collections. That museum continued to operate until 1995, when major renovations to the station building were begun under the leadership of Chuck and Margre Durham, for whom the museum was renamed. The Great Hall was restored to its original grandeur, mechanical systems were completely replaced, a new parking deck was erected, and a trackside area was covered to allow for display of Union Pacific rail cars. And man, the Suzanne and Walter Scott Great Hall is truly great! The center has a 65-feet high ceiling, there are ten cathedral-like plate glass windows, columns of blue Belgian marble, a wainscoting of black Belgian marble, and six thirteen-foot tall chandeliers. In addition to the museum exhibits, you can still visit Union Station's original Soda Fountain! You can enjoy an old-fashioned phosphate like we tried back in Iowa, or hand-scooped ice cream in a cone or as delicious malts, milk shakes and sundaes. They also run a candy shop selling a wide variety of nostalgic, old-fashioned candies including Black Jack Taffy, Kits, Mary Janes, Necco Wafers, and Rock Candy Sticks. And who can pass on fresh popcorn? I’m going to buy some candy for the road and then look over the museum exhibits, which range through history, culture, science, and industry, and include the history of this magnificent building. In addition to being the headquarters of the Union Pacific Railroad, Omaha was once the headquarters of the Burlington Railroad Company, earlier known as the Chicago, Burlington and Quincy Railroad. Their offices were located near the Old Market area in a building they remodeled in 1899 to resemble another of their buildings in Chicago. Nationally-known Omaha architect Thomas R. Kimball redesigned it with an atrium that ran from the first floor to the roof under a pyramidal skylight. He also outfitted the main floor with glass blocks that passed light from the atrium into the basement. After the railroad company moved in 1966, the building sat empty for several years, but has recently been rehabilitated and is once again office space. Many of the original design elements remain, including the stairway and balconies and part of the cast-iron Farnam Street façade. Another old industrial building that housed a major business in 1962 belonged to the Bemis Company, Inc., a global manufacturer of flexible packaging products. This used to mean bags, but now they also make vacuum packaging for meat products, puncture-resistant sterile medical packaging, and pressure-sensitive materials. Their original plant here was built in 1888. The company began making cotton bags for food products like flour, and moved into paper bags. They expanded into plastics with new plants in Indiana and New Jersey in 1956. As the company vacated buildings in Omaha, one of their warehouses became the Bemis Center for Contemporary Arts in 1981. Polar bear at the zoo. For the rest of the afternoon, I’m going to the Henry Doorly Zoo. Omaha’s Riverview Park was created in 1898 and by 1894 had become a full-fledged zoo. It was home to deer, grizzly bears, two bison on loan from Colonel William F. (“Buffalo Bill”) Cody, and 120 other animals. In the 1930s, several new exhibits were built by the federal Works Progress Administration. The Omaha Zoological Society was organized in 1952 to improve the zoo and made a big stride towards this goal in 1963, when Margaret Hitchcock Doorly donated $750,000. Mrs. Doorly made the donation with stipulation that the Zoo be renamed after her late husband, Henry Doorly, who had been chairman of the World Publishing Company. The zoo has been in a constant state of improvement ever since and now includes a train ride, the Ak-sar-ben waterfall, Mutual of Omaha’s Wild Kingdom Pavilion, the largest cat complex in North America, and a new aquarium. During some 1972 construction, an old public swimming pool that had been buried was rediscovered and is now the Owen Sea Lion Pavilion. It funny, but I always remember the Omaha Zoo for the TV program “Mutual of Omaha's Wild Kingdom”, a show that didn’t start until 1963. In a further muddling of memories in my kid’s mind, the show’s host, Marlin Perkins, wasn’t even with the Omaha Zoo, but worked for the Saint Louis Zoo! I’ve already mentioned some famous folks who were alumni of the high school, but you may know the names of some other people who were born or lived in Omaha. Of course, there’s the world’s fourth richest man, Warren Buffet, who is so well known for his ability to pick the stocks of profitable companies that he has been called “The Sage of Omaha.” Another native, Malcolm X, one of the icons of the 1960s black civil rights movement, was born Malcolm Little in 1925. While in prison in 1946, he converted to Islam and after his parole in 1952, he quickly rose to become one the leaders of the Nation of Islam organization. Throughout the next dozen years, he advocated black supremacy and the separation of black and white Americans, in opposition to the more mainstream movement for integration of the races. Shortly before his assassination in 1965, he became disillusioned with the leader of the Nation of Islam, Elijah Muhammad. Malcom X repudiated his earlier teachings, founded the Organization of Afro-American Unity, and changed his personal faith to Sunni Islam. The site of his birth home is now inaccessible, as the street has been torn out and a large parcel of land fenced in. Another famous Omaha native did not actually live here very long. Former President Gerald R. Ford was born Leslie Lynch King Jr. on July 14, 1913. Just weeks later, his mother Dorothy Ayer Gardner moved to her parents' home in Grand Rapids, Michigan, where he would grow up. She moved to exit an abusive relationship and divorced Leslie Lynch King, Sr. within the year. She later remarried Gerald Rudolff Ford, and the former President acquired his new name. Jerry Ford was not even aware of the existence of his biological father until he was 17. Jerry Ford attended the University of Michigan at Ann Arbor from 1931 to 1935, where he majored in economics and played on the university's national championship football teams. The house he was born in here was demolished after a fire in 1971, while he was still in Congress. After Mr. Ford became President in 1974, Omaha businessman James M. Paxson purchased the property and in 1977 the birthsite monument was dedicated. The Ford site is near Hanscom Park, Omaha’s oldest remaining park. The first improvements to the park were made by 1898 and included two lakes, a cascade, flower beds, two and one-half miles of roadways, fountains, and trees. It still includes some paved trails and the lakes are used for fishing and ice-skating. Driving around as I look for dinner, I pass by ConAgra Foods’ giant new riverfront campus. This is one local company that has kept its headquarters in Omaha and dates back to the founding of Nebraska Consolidated Mills in 1919. In that year, Frank Little and Alva Kinney consolidated four grain mills, and their company was initially headquartered in Grand Island, Nebraska. They moved to Omaha in 1922 have been growing ever since. By 1951, the company funded the creation of the Duncan Hines cake mix brand as a way to market more flour. This was very successful and the company shortly became the third largest flour miller in the U.S. However, Nebraska Consolidated Mills did not move into other food ventures at that time, but sold the Duncan Hines brand to Procter & Gamble in 1956. Instead, they expanded into such industries as fertilizer, catfish, pet products, and selling more raw foods like flour and grain. Inflation in the early 1970s brought the company to the brink of bankruptcy, as profit margins on such commodities were nearly wiped out. New management set the new program of manufacturing and selling consumer products directly, beginning with changing the corporate name to ConAgra Foods in 1971 and a purchase of Banquet Foods in 1980. Variety of foods from 1962 that are now produced by ConAgra. Near the ConAgra headquarters is another historic district of industrial buildings, along with some old brick streets near the old Anheuser-Busch Office Building. For nearly 100 years, from about 1860-1960, the Anheuser-Busch, Metz, Krug, and Storz breweries made beer here, but beginning in 1961, most disappeared. Metz was the first to go, moving production to the Walter Brewing Co. of Colorado. Anheuser-Busch expanded by buying out Krug in 1972, and Storz was sold to Grain Belt Breweries of Minnesota that same year, which ceased production at the Omaha brewery. The story of consolidation and brewery closure is very similar to what happened in Milwaukee, Wisconsin during this period. I’m guessing we could have still bought all three brews in Omaha in 1962. The Anheuser-Busch Office Building is the only remaining structure of what was originally the Krug Brewery, once the largest of Omaha's beer brewers. The Romanesque Revival style building was part of the complex designed by Omaha architect Henry Voss for Anheuser-Busch in 1887. During the 1960s and 1970s, the building was a private residence and is currently the offices of an advertising agency and art gallery. Elsewhere in the area, the Storz brewery’s chimney still exists, as does a Metz sign painted on a brick building. Let’s visit a different sort of historical building, Saint Cecilia Cathedral. I’ve been in churches and cathedrals, and somehow the cathedrals always seem to be special places of worship. For me, it’s the large spaces and rich architectural details that make them special. Saint Cecilia certainly has the size to be awesome; it’s one of the ten largest cathedrals in the United States. Because it also sits on one of the city’s highest points, Saint Cecilia Cathedral is a dominant feature in Omaha. Inside, there is a nearly 80-foot vaulted ceiling with colors coming down onto eight magnificent Charles Connick stained glass windows along the sides. The central figure of Christ on the cross is unusual here, because he is not looking down. Instead, sculptor Albin Polasek created a statue looking up toward the stained-glass windows and beyond, to reflect the optimism of the post-Civil War migrants who settled here. Another feature that always places me in awe is how long it takes to build a cathedral. The first brick at Saint Cecilia Cathedral was laid in 1905 and the last brick 1959. In 1962 we would have seen a building that was technically quite new, though parts were already 50 years old! During the course of such an undertaking, money is always a problem. In the 1930s, the diocese ran out of money to buy the eight kinds of marble that architect Thomas Rogers Kimball had specified. Raising the funds to complete the building took many years, sometimes at a dollar or less per donation. As with most cathedrals, you can either wander at your own pace or receive a tour. Well, it’s time for dinner now, and once again, there are just too many fine older restaurants in town. Of course, Omaha is best known for its steak. There are dozens of authentic Omaha steakhouses throughout the city, so here’s a couple of those. Johnny's Café was opened in 1922 by Frank Kawa as a small eight-seat saloon next to the Omaha Stockyards. It’s still in business and still family owned. Johnny’s specializes in slow-roasted prime rib, midwestern corn-fed, hand-cut steaks, and chicken and seafood. In the 1960s, the original owners sons took over the restaurant and completed a major, two-year remodeling project in the 1970s. So the place is updated with its now famous front doors and iconic dining room mural, but the food is traditional. If I decide on Johnny’s, I may try the Petite Filet Mignon: Filet Mignon was always my dad’s favorite steak. Or there’s Gorat’s, founded in 1944 by the family of the same name. They also serve quality steaks, along with Italian specialties. Gorat’s is no longer run by the original family; it was purchased in 2012 by a longtime Omaha restaurateur and extensively updated. You might see the “Wizard of Wall Street”, Warren Buffett, walk in, as he is know to eat here. More on Mr. Buffet later. Or we could try Cascio’s Steak & Pizza House. Al and Joe Cascio opened the restaurant in 1946. This was Al’s second restaurant. We will not see the same place we would have in 1962 here either, as the original building was burned by an arsonist in 1978. But they still simmer their own spaghetti sauce for seven hours. All things considered, I could buy a good steak dinner in many cities, but how often would I find authentic Czechoslovakian fare? Well, in Omaha I can find it at the Bohemian Café at the Prague Hotel. The Bohemian Café has been serving such European dishes since 1924, and since 1959 in their current building. And to make the experience even more authentic, the friendly wait staff is dressed in traditional Czech outfits and there is old world décor in every nook and cranny. So what is Czech cuisine anyway? Jaeger Schnitzel (veal steaks in wine sauce and mushrooms), Svickova (Czech style sauerbraten), Czech Goulash, and liver dumpling soup are just a few delicacies we’ll find on the menu. Even dessert is traditional, with Apple Strudel, plum dumplings, or Kolacky (fruit filling in a circle or twist of dough). I plan to enjoy my meal with some imported European beer, perhaps Pilsner Urquell Czech beer. "Na zdraví!" After dinner, I’m just going to drive around to see more of Omaha before I settle down in a motel. I noticed this morning that the area around the Joslyn Castle has some other nice homes, though none on the scale of the castle. Just south of there, near the University of Nebraska Medical Center is another such area. And further west from downtown along US-6, we pass near or through several residential historic districts, including Gold Coast Historic District and Happy Hollow Historic District. The Happy Hollow Historic District includes the city’s Elmwood Park and is also known as the Dundee area. Elmwood Park is a beautiful place for an evening stroll, containing plantings of perennials and a natural spring flowing from rocks, and even a golf course. I always enjoy driving through areas like this, with their lazy, curving streets, large trees, and architectural variety. Many of the residential properties here retain a high degree of architectural integrity on large lots. Or, along the old streetcar routes you will see duplexes, rowhouses and apartment buildings. Proof of the continued desirability of these historic neighborhoods is that people who can choose to live anywhere, choose to live here. The Dundee-Happy Hollow Historic District is home to nationally syndicated editorial cartoonist Jeff Koterba and billionaire Warren Buffett. Part of a June 1962 interview with Warren Buffet on Omaha’s KMTV. Warren Buffet is probably Omaha’s most famous resident and he has occupied a spot as one of the world’s five richest men for decades. He was born in Omaha, and sometimes worked in his father's stockbrokerage office as a child, writing stock prices on the blackboard. At 11 years old he made his first investment, on which he made a small amount of money and learned about patience in investing. Mr. Buffet returned to Omaha after college and worked as a stockbroker. In 1954, Warren Buffett accepted a job at the partnership of Benjamin Graham, considered the father of value investing. Benjamin Graham retired and closed his partnership just two years later, so Mr. Buffett opened his own investment partnership. He continued to create partnerships and in 1962 he became a millionaire on the value of his various partnerships. He then merged these partnerships into one and began to acquire stock in, and eventually control of, Berkshire Hathaway, the company that became his vehicle to amassing a net worth of billions. Despite the opportunities that come with being a billionaire, Mr. Buffet still lives in the same modest Omaha home that he bought in 1957. Just one more stop tonight before retiring; the Rose Blumkin Performing Arts Theater. Also known as The Rose, this is a renovated Riviera Theater, built in 1962. Both inside and out, it is an unusual architectural mixture of Moorish аnd Italian Renaissance styles, which its architect John Eberson described as Hispano-Italian. Its exterior focal point is a large copper-domed tower, with two smaller towers of similar style on either side. The interior had a domed ceiling painted dark blue with small, recessed twinkling lights to look like a night sky, and the lower lobby had water fountains and aquariums. The Riviera originally showed both stage shows and movies and was sold to the Paramount Company in 1929, being renamed the Paramount Theater. I’m not surprised to find that a unique and magnificent theater was rebranded as a Paramount, as we have seen several of their other beautiful theaters along both US-23 and US-6. Besides being a movie theater, parts of the interior have been used as a miniature golf course and bowling alley over the years. The name was changed to the Astro Theater in 1960, so that’s what we would have seen in 1962. 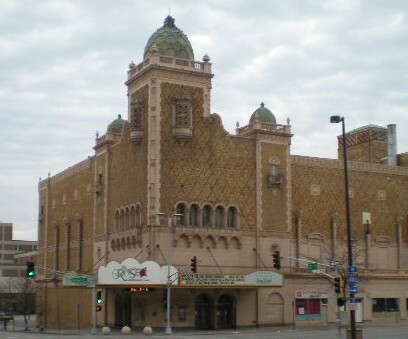 The theater closed in the early 1980s, but was purchased in 1986 by Rose Blumkin, founder of Nebraska Furniture Mart. After renovation, it is now open and hosts both stage shows and movies again, targeted towards families. If I’m lucky, “A Wrinkle In Time“, the novel of which was published in 1962, will be playing tonight. Or maybe Charlotte’s Web or Disney’s Mary Poppins; all are on their season calendar. After the show, it’s off to bed for me. I’ll see you tomorrow on Roadtrip-’62 ™ , and we’ll travel to the capital of Nebraska.